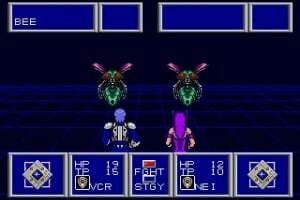 Hailed as one of the greatest games of all time by fans and media alike, Phantasy Star II is an RPG that features an epic storyline and turn-based battles. Play as Rolf, Nei, Rudo or several other characters as you navigate through the Algo Star System battling the evil Dark Force. Build your characters, select the right weapons and armour and battle the forces of evil through various missions as you find the right combination of characters to complete each objective. Experience the magic once again in this great sequel! Eh get the genesis collection you get all three genesis phantasy stars. The game isn't that great feels a bit dated. Yeah, a good solid rpg, but not as accomplished as either the first instalment, or the fourth. I love this game!!!!!! I hope the USA gets this soon!!!!!!! It's about time Phantasy Star hit the VC! Even though this is one of the worse PS games (tied with 3 and worse than 1 and 4,) it's still well worth $8. Giving it 4/5 stars because it's not PS4 or PS1 and it's on Sega Genesis Collection. A game I remember from back when I never had a Genesis (would go to friends house). Was a great game but nothing compared to what the FF series could ever do. It's worth the 800 points for goodness and nostalgia unless you have the Genesis collection. I had this on the Sega Smash Pack for Windows. It was loads of fun, but the enemies are extremely hard. I found myself taking forever racking up experience from weaker monsters before moving on to such a close-by area, so I progressed through it very slowly. Even so, the patient gamers will have a great time with the advanced customization and relaxing music. I also happen to like the sci-fi background better than a midevel style background. (Dragon Quest, Final Fantasy 1-6 and 12) Since I have this game on PC though, I'm holding out until Phantasy Star 3 and 4. I've only played the Phantasy Star Online titles, but so far, I really like the soundtrack for this game. I really like this game. The first RPG I've ever played. I love the storyline, and the Sci-Fi setting. Its VERY hard, but rewarding imo. Still, PSIV is MUCH better. "A game I remember from back when I never had a Genesis (would go to friends house). Was a great game but nothing compared to what the FF series could ever do. It's worth the 800 points for goodness and nostalgia unless you have the Genesis collection." What PSII did is kick FFII (Famicom) right in the face with its extraordinary storyline and presentation, excellent music and its insane lenght. For a game released in 1988, yes, it was FAR MORE than anything FF could ever do. Seriously, the best RPG ever made. Amazing storyline, great plot twists, awesome music, and some of the most challenging dungeons ever. Poops all over any of Square's efforts. Is this game easy to understand and worth buying? It's a pretty straight forward JRPG, very enjoyable. I've heard that this game is the weakest link in the PS series. Still, having not played any of the PS games (shame, shame!) I'll definitely be giving it a try when it's released here. PS1 is awesome and hopefully that will be up soon. But so far ive loved this and i havent even beat the first dungeon yet. I have it on SMD Collection for PSP & i have the PS2 version of SMD Collection aswell. Chances are i wont buy it on VC no matter how great i think it is. @Jogurt: Definitely not the weakest link (PSIII holds that position firmly), but far from the strongest.. This is one of my favorite RPGs of all time. I can understand that if you didn't play it when it came out, then you won't enjoy it as much as I do, but it is indeed a gaming classic. I no longer play turn based RPG's, but I will DL this the day it hits the VC. IMHO this is by far the best Phantasy Star game both for it's story and gameplay experience. A lot of people love the fourth edition to the series but that was just this game repackaged with better graphics and a story that doesn't really seem like it's part of the original story. PSIII was a disaster. As were the PS Online games. I can't tell you how disappointed I am in those games. They are just poor games with the PS brand. This is a fairly hard RPG if you don't use cheats, and impossible if you don't look at a map. There aren't really any parts where you have to level up as long as you fight everything that pops up. Either way you're going to have to fight for xp, but if you fight everything that pops up, you won't need to spend hours leveling up. Really good story, some really good music, and a lot of different npc's to fight with you. Great Game imho. @Steady: Well, I'm not a PS veteran like you, but from what I've seen, there's nothing that would make me choose PSII over PSIV. Like I said somewhere else, this is a solid game, but does smell kinda funky in the year 2008. To me, the upgrades in PSIV DOES give me a more appealing experience than this. However, the beginning of this game and the first dialogue with Nei sends shivers down my spine for some reason. Mmm.... it is indeed a good game, although not nearly as refined as Phantasy Star IV, which is, by my RPG standards, the best in the series =) Even so, Phantasy Star II is a wonderful game, and deserves some attention. So if I just finished FF6 Advance, will this feel really outdated? I have it on the Sega Genesis collection but only played it for a bit. I didn't enjoy what little I played but it was just kinda blah in my opinion. You may think that makes guns useless but remember that guns ignore defence. Does this stats calculation anything for me? I mean, I've never been a stat-crazy power gamer, but even if- would anyone have the possibility to une this knowledge to make his or her game easier than actually going for the baddies untill you go up another level!? That last part is what still draws me to this game. It's absolutely the nostalgia factor for me. 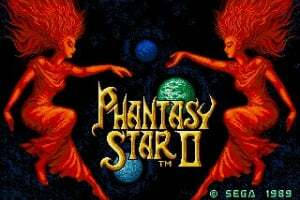 I played the original Phantasy Star and PSII as a kid. I was probably 9 or 10 when it came out and it was just an awesome experience at that time. Like I mentioned before, I wouldn't be caught dead playing a new turn based RPG, but I will play this one just to hear some of the old sounds and the music. The music and story are what drives this game. I can't wait till tomorrow! This game is truly a classic, its got one of the best storylines of any game to comeout in the 80s, and even rivals many games in the 90s. This game set the standard for years to come for story in RPGs. What now seems cliche was done for the 1st time in this game. Also a shocking ending to anyone who sticks through to the end in this tough game. Taking place across three planets, this game is truly epic. I give it the well deserved 5 stars. As a warning this game is hard, but well worth your time. 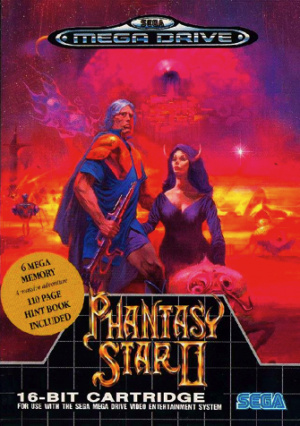 IMO, the worst Phantasy Star game but still a great game. I hate the ending and it's a major departure from the first game. If you think this is hard you need to play the first game. This is the most expensive game I ever bought and it was a big disappointment. Not even close to the greatness of the original. I think you forgot about PSIII. Easily the worst one by a landslide. The first game was EASY compared to this. To be honest, are ANY turn based RPG's like this even "hard"? And Im also confused about your statement about it being a "major departure from the first game". It's essentially the same story 1,000 years after the first game. You still visit the same three planets. In fact, I think this is the closest to the original in story then all the others. @STEADY MOBBIN 22: Thank you so much for this awsome website, that really really made my day! 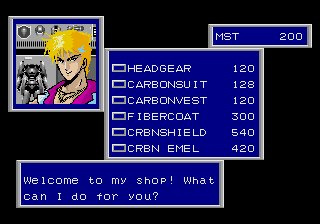 Phantasy Star II broke my RPG cherry, and as such, it holds a special place for me as being responsible for turning me into an RPG-Gamer. I'll be the first to admit it hasn't aged as well as other games of its era, but it's definitely worth the time if you can live with the sparse character interaction. Seriously, the only characters who even remotely have any interaction with one another are Rolf and Nei, but due to the entirely optional nature of any of the other characters (you can seriously finish the game without obtaining ANY of them and still not miss any kind of story dialogue), apart from having the decency to introduce themselves upon entering your party, and some sparse profile data, they are only in your group to help you beat the living snot out of anything you encounter. Nevertheless, the game itself is good enough to make you overlook that fact entirely. Part of its charm (at least, in MY case...) is that you start filling in the blanks by imagining personalities for the other characters in your party. The dungeons are menacing, and often borderline frustrating; if the monsters don't get you, the insane layouts will. The monsters themselves are fairly decently animated for their time (especially compared to games like Shining in the Darkness, Phantasy Star 1 and Final Fantasy), and some of their attacks are downright devious (some of them even clone themselves!). I'm making this sound like it's a bloody terrible game, but seriously... give it a try. Get the feel of it. Before long, you'll find yourself compelled to keep going, if only because the story unravels itself in such a way that keeps you curious as to what will happen next. 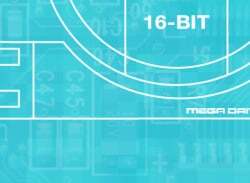 Once on original Megadrive (I even had the hint book, but I lost it...), once on the GBA collection, and once on a Dreamcast collection of classic games. Aheheh. I can only hope that the completely remade Playstation 2 version will see an English-lingual release some day, since as far as I heard, that version manages to fill in the blanks rather nicely, and added some extra features that may seem fairly mundane and obvious to people who have grown more accustomed with today's JRPG's, but which the original painfully lacked. The PS2, PS3, & PS4 versions all have the same top down view throughout. PS3 was the very plan version that didn't even take place among the Algol star system. And I don't think you ever completed PS2 if you think the dungeons are easy. The monsters in most dungeons are so over powered and as the guy above said, some of the level layouts are insanely frustrating to navigate. Especially the island level where you search for the tree to make the gum. Download the game, I don't think you played it. I have this on GBA but will probably download it eventually, if only to be able to play it on a much bigger screen. I never beat it....and I agree that some of the dungeons have downright crazy layouts.....good stuff, though. 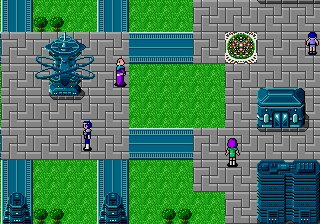 back when I first got my sega CD, I wanted this QTE power rangers game lol and my dad came home with phantasy star 2 which had a $99 price tag on it. I couldn't believe he just picked it up for me without me even knowing the game existed. I was so grateful.... I loved this game and I'm goin on mah wii to download it right now! YAY! Steady Mobbin, I played both games years ago so my memory could be playing tricks. Both games have tough monsters, and that’s what you refer as hard. In reality it’s not hard, you just need patience and level up. If you played Phantasy Star you know that the 3D dungeons can be more frustrating. That’s what I refer as hard but I guess both games are challenging compared to modern games. Anyway, all the games are great and worth playing, I’m just a very big fan of the first game. Well, sort of. You can only choose which enemy type, but if there's more of one kind of enemy, you can't select which of them to attack. For me, the 3d dungeons are much easier. I also wish they would have kept them. Much more fun. Not because they are easier (for me) but because they were different at the time and they also break up the same top down look. I am also a huge fan of the original. GREAT game that deserves a remake. looks like Breath of fire ll. But I think I'd like BOFll more. But thats okay, phantasy 4, made up for the bomb ps3 droped. Love this game. Doesn't take up much space on the Wii's hard disk either (approx 32 blocks). I.. i got the game cause im a give fan of ps3, so far its pretty cool (a few gameplay decisions i dont agree with but its fine). I went back to roron and yellow dudes that i talked to to get scooter are gone!... so where do i find it? i need that thing man, i dont want to restart game... I know you are reading this mods, making sure its safe.. please it will just take a moment of your time, where do i find my scooter? Hi Shrapnel109 -- The scooter will be located in the nearest body of water from whatever town you saved in. It won't necessarily be where you left it, however, so don't let that throw you! Just look around the shore. Which town did you save in? I dont know the rules about off site links. so if this is a rule breaker my bad. but as a game fan. knowing where a ps2 walkthrough was. I just had to help the dude out. I personally love this game -- a friend gave me his used copy after he was done playing it way back in 1990 and it was my first introduction to RPG's. Ever since then, I've been a huge fan. I have the music from this game in my iTunes! Yes, it's an insanely hard game without a walkthrough (I don't know how I could have beat it back then without the book it came with! Especially that last dungeon with the endless teleporters). And yes, there are some annoying aspects of the game (I found out what "Nasak" was the hard way! And touching that damn piano!). But overall a great game that I am playing through again, 18 years later, thanks to the VC! I remember the first time i got ps2, it was in the heat of the 16 bit console wars. i had decided to trade my snes to a genesis. and i got phantasy star 2 and sevral other games. 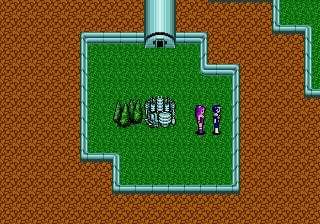 over all in my entire genesis experience the phantasy star series left the deepest impression on me. A story to an rpg that wasn't crucified for the sake of translation for an american audience? More ever an rpg brought to the states that wasnt dumbed down assuming that americans where too stupid to play an rpg, (like certain ff games where at the time.- I personaly find such tactics insulting from the japanese market) I have nothing but love for the phantasy star series. it was the first rpg I had ever played that didnt rely on corny catch phrases (example- final fantasy 6, what does; she is loaded for bear mean? till this day I still dont know o.0) and drippingly cute environments to hide a rough story translation. this game has a beautiful story. and I say this with all honesty,. I will remember this game fondly till my dieing day. 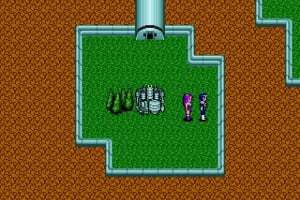 I'm an long-time RPG player, but I never played Phantasy Star II until about two weeks ago. I just got a Dreamcast with the Sega Smash Pack, and I tried it out. It's pretty fun. I think I could really get into it. I actually had been playing for about four hours when I decided that it was time to quit. Guess what? Am I doing something wrong? Any ideas? Maybe the VMU's are bad? You have to go back to the Smack Pack menu by holding down A, B, X, Y and Start simultaneously. First you save your game at the save point, then you press the A, B, X, Y and Start combination to get back to the Smash Pack menu. From there, you choose "Save Game." It saves the game, then on the same menu you choose "Resume Game," (I THINK that's verbatim) and you're all good. If you didn't save at the save point in the game, however, the option to save on the Smash Pack menu isn't available. Weird, but I was very relieved. "I find it hard to believe you didn't die in the first 4 hours. (Not saying you're lying, just that for s first timer, I'm shocked.)" Yeah, I'm a big "level-upper." I actually just lost a character for the first time after playing for about 16 hours. I guess I'm just really careful. Ugh. This was my worst VC purchase. Remember growing up playing this game religiously...definetly takes alot of time to beat, gaining experience, and decent story. IMO, its one of the most underrated games of all time. 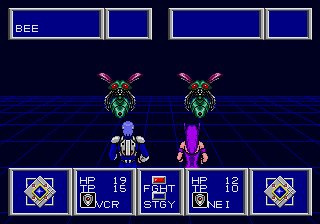 I haven't played as many games on the Genesis as on the SNES or even TG-16, but I really think Phantasy Star 2 is one of the very best games on the system. PS2 and 4 (and the original on the SMS) are a wonderful, fantastic franchise which would have very nearly been worth mentioning along with Final Fantasy and Dragon Quest had it only kept GOING--granted, PS1, 2, and 4, are basically a trilogy that are a complete story, and 3 is sort of a sidestory that ties into it in an interesting way. 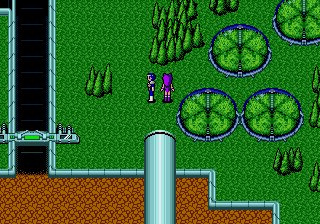 I recommend somehow getting the original Phantasy Star and going through that first as (for once) these RPGs have some continuity. The first two games have some of the meanest dungeons ever (PS2 was originally packed with a guide with maps). I'm tempted to say that, in spite of its quirks, this is the series' high point, though they ALL must be played. The overall story and presentation is fantastic, with a compelling setting. Great game. But don't buy it on Virtual Console, not when there's Sega Genesis Collection and Phantasy Star Collection. The appeal of old games like this is the ambiguity in the items and characters. Better than Phantasy Star III but not as good as Phantasy Star IV. Get all that? Meh. I'm not so sure. PSIV is WAY more playable and palatable, and just plain easier dungeon designs (the only non-MEAN PS game). The larger amount of dialogue and story scenes are more familiar from one used to SNES RPGs. But I still think PS2 has the higher ambition in every respect, that makes it more memorable, with the story (though sparse, it is EXCELLENT), great characters--which a few of PSIV's were surely based on--and memorably-fiendish dungeons and boss fights. But look, folks, you must play the whole series! PSIV feels kind of redundant after PSII but it's really polished (and the end of the three-part epic), while it's a continuous story with each game feeling unique. PSIII has a great sidestory too, even if it's a pretty ugly and cumbersome game. I'll take Phantasy Star IV, if it comes out. I kinda think II was overrated, though. Is it just me, or do Nei's attacks sound like fingernails on a chalkboard?